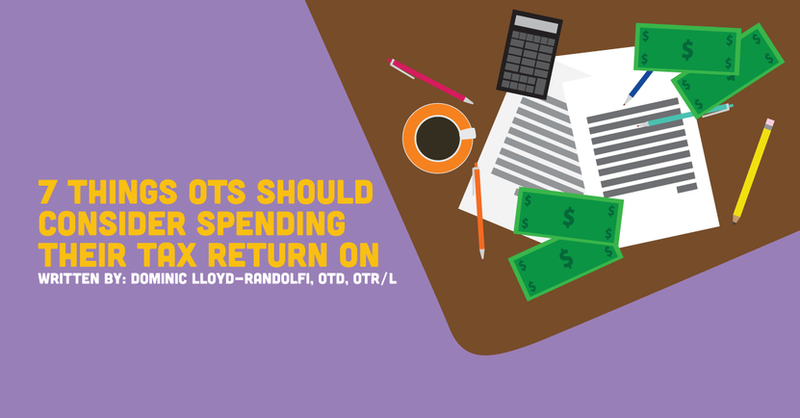 Almost all working occupational therapists should be expecting and receiving some sort of tax return this year. It’s tempting to spend it on tangible goods, but before spending it frivolously, remember this is money the Fed is returning to you. The money is not a gift — it was yours all along. Take a second to examine your needs and your situation. Instead of buying “stuff,” invest in yourself and have your money work for you. There’s various paths one can take to do this, so read some of our suggestions and see which may be the best for you. This is first on the list because it is objectively the most important. If you don’t have an emergency fund, now is the time to start. Funds like these are important because they protect you. Car breaks down or suddenly laid off? Now you have a buffer and don’t need credit cards with insanely high interest rates. Most people agree that you will want anywhere from three months to six months of living expenses saved up. Before you do that, though, you’re going to need a budget. Your emergency fund can also be dependent on where you are right now in your life. Have kids and a house? You might want to have more saved up since little ones are relying on you. Are you single and live close to family who can provide support if needed? Then you can probably get away with less in the bank. That being said, you will never regret having a savings and emergency fund. The trick here is that you don’t want TOO much in your emergency fund. Why? Because your money could be somewhere (in a different account) working FOR you. You’re probably already contributing enough into your 401k or 403b to receive company match. So what does your tax return have anything to do with it? Well, there are some rules guidelines. Here are some new suggestions from Fidelity via Benefits Pro on how much you should have saved by age. And some even say those numbers are too LOW. There’s a graphic (or idea, if you will) that is often shared around the internet for those new to retirement and it does a great job of illustrating the importance of starting early. The idea is that if you invest from the ages of 25-35, you will have more than if you invested from ages 35-65. Don’t believe me? Here’s a graph from JP Morgan Asset Manager. Consider using your tax refund this year to open a traditional IRA or Roth IRA to supplement your retirement outside of work. Remember that graph up there, the one with the curves? Well, that is how the interest on your student loans works. However, those loans are compounding interest against you and if you don’t pay them down, they are only going to grow exponentially. It’s overwhelming, I know. While I'm paying off my debt, I've been reading up on success stories from Student Loan Hero to help keep me motivated. The team at FitBux has also been instrumental in helping me understand my loans and create a repayment strategy that works for me. Using your tax refund to pay off your student loan debt is a worthy and noble cause. Think of how great it will be to be debt free. You’ll have so much money for activities! You can also take this time to save your refund for something much larger. Purchasing a home tends to be a goal for many new grad OTs. So is buying a new car. This is a chance to jumpstart your goals and not frivolously blow away your refund. Try something like Ally Bank with a higher than average rate for your savings account so your money can (slowly) grow for you. Well, if you have taken care of everything else, congrats! Now you can use your tax return for a little fun. Head on over to Wall Street and see if you can grow your money even more. Get your feet wet and try out Acorns. They will give you $5 to start off with. This is pretty self-explanatory: once you get comfortable, then you can play with the big dogs. This is awesome! I believe it should be everyone’s goal to be financially secure enough that they are able to donate to their favorite cause. I know for a fact that the American Occupational Therapy Political Action Committee (AOTPAC) does a lot for our profession. Once I get my loans squared away, they will be the first of many to share my hard earned cash. As always, feel free to leave a comment below and share what you are planning on doing with your tax refund. And please remember, we are experts in occupational therapy, not investing or taxes. Please seek out a fiduciary or certified personal accountant for your specific questions!